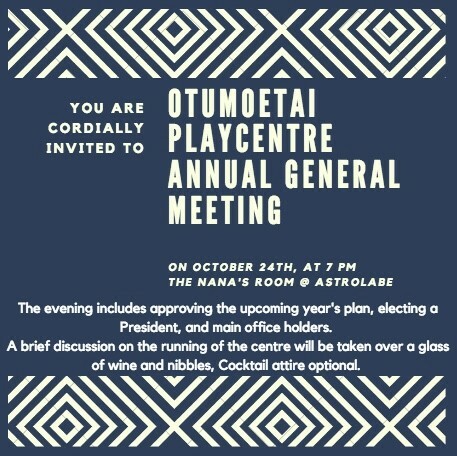 Otumoetai Playcentre is holding it's Annual General Meeting at Astrolabe in Mount Maunganui. It is a Glamour themed event, inside Astrolabe at the "Nana's room". Topics of discussion include a review of past and recent performance, some thanks to the centre office holders and an Opportunity to be included in the decision making process around positions which are available. Please R.S.V.P by Oct 20th to otumoetai@playcentre.org.nz include your name and contact details.